I'll be adding some new Offbeat Messengers to my shop this afternoon. The bag shown above is made from cotton corduroy in a camel color with an ultrasuede applique and a vintage button. All the new messengers have an adjustable strap, two interior pockets and a key clip. The key clip is a new feature that I added to my messengers to help keeps things organized and easy to get to. I'm working on some new Wayfarers this week and hope to have them in the shop this Friday. They now come with two interior pockets. I am adding more functionality to all my designs. Function + Design = A Great Bag! Here's a little sneak peek into the Pesky Cat Designs studio. Posted above is a new messenger bag made from cranberry red corduroy and an ultrasuede cherry blossom applique. It will be available in my shop tomorrow along with a few more new corduroy handbags. Stay tuned! What do you think of the fabric combination posted above? I love it! It's a gorgeous velvety soft red corduroy and a Waverly Harmonics Collection black and white cotton print. I plan to make several bags using this combo. I'll be posting my progress in the studio this week so check back soon! 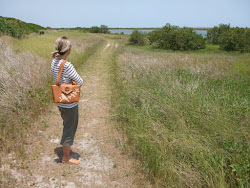 My Offbeat Messenger posted above is slightly less traditional than the classic messenger bag but just as timeless. It has a shorter flap that covers the entire top portion of the bag to keep your stuff secure. A magnetic snap on the flap keeps the bag closed. I added a few to my shop last week and they all sold. I'll have more available in some new colors in corduroy sometime next week! 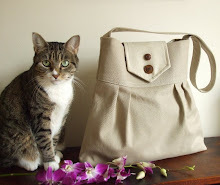 In the next hour or two I'll be adding new corduroy handbags to the Pesky Cat Designs shop. The Wayfarer Purse posted above is made from pumpkin spice corduroy with a raw silk bird on a branch applique. It will be available today along with four other new creations! I've reached the final stage of creating my newest batch of handbags! Yay! I'll have five new corduroy handbags to add to the shop tomorrow and if I am lucky I'll be able to complete one or two more. I was not able to spend as much time in the studio this week as I hoped to. Posted above are the finished lining pieces for my handbags. The final step will be to attach the straps and sew the lining to the bags. By the way, all my new handbags will now have a least two pockets or more. I had some feedback concerning this from a very nice potential customer. Tomorrow I plan to post some of my finished handbags and add them to my shop. Have a great day! Today my trip to the garment district in NYC was a total success! I was looking to replenish my supply of corduroy that was down to zero. Well, I hit the jackpot! I found a wonderful shop that carries corduroy in every color that you can dream of. I mean probably at least 40 different shades to choose from. I was in heaven! I had such a hard time deciding but finally selected cerulean blue, cherry red, grape, pumpkin, camel and chocolate brown. I left the store with a big smile on my face. I couldn't wait to get back to my studio and take another look at my treasure. I plan on creating some new Messengers and Wayfarer Purses in corduroy that will be available end of next week. I also plan to make some Pleated Everyday Bags using this lovely fabric! I've added a few new handbags to the Pesky Cat Designs shop today. Spring is just around the corner so I've made a couple in different shades of blue inspired by thoughts of warmer weather and bright blue skies. Enjoy! Posted above is my newly designed messenger bag! I'm really happy with it. It has a large flap that goes over the front of the bag like a classic messenger. There's an adjustable strap and two interior pockets. I'll be adding a couple to my shop tomorrow afternoon. In the past few weeks I've received a lot of requests for my messenger bag in corduroy. As of now I am all out of corduroy fabric:( But I am expecting a shipment in the next week. Corduroy is one of my favorite textiles to work with so I am really looking forward to having it back in the studio. My Pleated Everyday Bag, posted above, made it to Etsy's front page two days in a row! It was featured yesterday and this past Sunday. Thanks Etsy! And thanks so much Slide Sideways for creating such a gorgeous treasury! Check out Scott and Jacqui's shop for beautiful silk-screened posters, pillows and lots more. As of today my shop is sold out of my Pleated Everyday Bag so I plan on creating more this week. I've been wanting to try some out in corduroy. I think they would look awesome. Yesterday I made a trip to some local fabric stores looking to replenish my stock of corduroy but didn't find anything I liked. Either the quality of the fabric was not quite good enough or the color was not what I was looking for. I was so disappointed. I'm like a kid in a candy shop when I'm in a fabric store so you can image how difficult it was to leave without my candy bar! Yesterday I had two front pagers on Etsy. Thanks Etsy! My Wayfarer Purse with a cherry blossom applique made it to the front page posted above and was created by an Etsy administrator using the search term "branch". I love all the picks. Featured in this treasury are Kyleanne1, ThalassaJewelry, Joom, BionicBenz, PeskyCatDesigns, SilhouetteBlue, NameSakeDesigns, 4TheSparrowsNest, TrystByKerry, IreneSuchocki, CelesteLaurenDesigns and ThePaperApartment. Yesterday my Pleated Everyday Bag also made it to the front page! See post from 2/08/09. My Pleated Everyday Messenger/Shoulder Bag made it to Etsy's front page today! Thanks Spazzy for including my bag in your lovely treasury! This front page featured ellabellamay, simplytwisted, pilotdesign, vivaphotography, humblebeads, rockentot, peskycatdesigns, econica, peguinandfish, sugarplumetree, amorluxe and plusonedesign. I'll be adding a couple of handbags to the Pesky Cat Designs shop in the next hour. The Wayfarer Purse posted above is made from a cotton duck fabric in cornflower blue with a ultraseude applique in chocolate brown. I love this color combination. Perfect for the spring or to warm up your winter days. Don't you think?! It will be available in my shop today. I'll also have a messenger bag available in this color combination next week. Stay tuned! I'll be adding a couple of new Wayfarer Purses to the Pesky Cat Designs shop in the next half hour or so. The one posted above is part of my spring collection and is made from a cotton canvas in olive green with an ultrasuede cherry blossom applique and a vintage solid walnut wood button. More handbags will be added to the shop tomorrow. I'll post a heads up. Hope everyone is having a good day! I've made some revisions to my Pleated Everyday Bag. It now comes with an adjustable strap that is approximately 26" to 46" end to end. That means you can wear it like a shoulder bag or across the body messenger style! I personally love wearing it like a messenger. It also comes with three interior pockets so it's easier to keep things organized. The seams are all triple stitched and extra reinforced at the stress points, as are all my handbags, so it's quite sturdy. I added one to the shop yesterday made of cotton twill in a lovely key lime color. A perfect color to take you into spring. Many new fabrics are now waiting in the Pesky Cat Designs studio to be transformed into lovely bags. Lots of new colors for spring such as key lime green, cornflower blue, burgundy red and more. I'll be adding more of my spring collection of handbags to the shop in the upcoming weeks. I love collecting vintage buttons and using them to adorn my handbags. I prefer if they are made from natural materials such as vegetable ivory, wood or mother of pearl. Etsy is a great source for vintage buttons. I also shop my local antique shops such as Archangel Antiques in New York City that has drawers and drawers filled with gorgeous buttons. Below is my Downtown Bag adorned with three vintage vegetable ivory buttons.